After a break of a couple of years, I found an old archived hard drive with an IDE interface. I then resurrected a ten year old PC with that interface (most modern PCs only have SATA interfaces) so this took quite some time. Work has now completed on bringing all the files back to this section. This section is now complete. Infrastructure files are coming back! Infrastructure Section being rebuilt with the new page format: most links should work whilst "UNDER CONSTRUCTION" even if some images don't appear. Files with visible thumbnail images will link to pages that have been updated recently. no consistency of including, naming or placing readme.txt files, so an UNZIP could over-write a previous readme.txt which had been placed anywhere from \Microsoft Games\ to \Routes\MyRoute. I therefore developed a standard which I'm using on all structures and infrastructure items at this site. I will still be using an installer, but the end-user will still need to move shape and texture files as well add the model's details to the .REF file, but this procedure will be made as consistent and simple as possible. 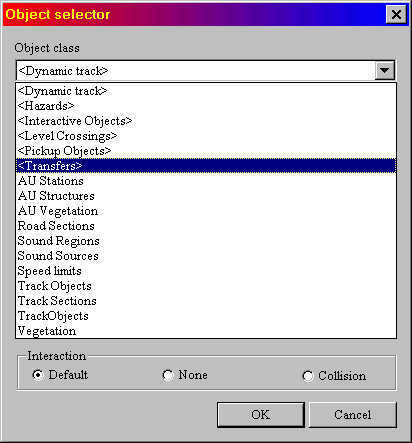 Every model on this page will open into a folder within the "Routes" folder of MSTS. This folder will be known as "AU_AddOns " and each model will install into its own folder underneath. Each model's .S, .SD, .ACE, readme, add_to_ref files will be consistently and clearly named so that you can identify all the components of the model; all WILL begin with AU_, something I introduced when this overall web site was initiated. The "readme.txt" and the "add_to_ref.txt" will remain in the folder, shapes and textures will be in their own folders. This means if you need to re-install a model, or you wish to acknowledge the copyright owner in the route you will be distributing, you will have no trouble in finding this information. The readme.txt file will contain a folder map of what files go where as well as the classification and the name you will find it under when you click on Placement | More in RE (which brings up the "Object Selector" pane shown below). I hope that this will assist the route builders in keeping track of their Australian model add-ons. 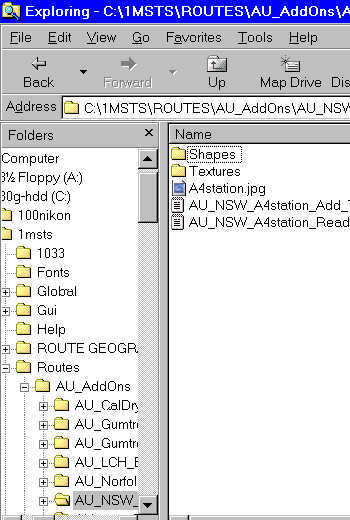 you will then need to copy the shapes to the route's Shapes folder and the textures to the Texture folder. The add_to_ref file contains the fragment of code that needs to be added to the route's .REF file. Thereafter it's a simple matter to find the model in the Placement | More section of Route Editor.